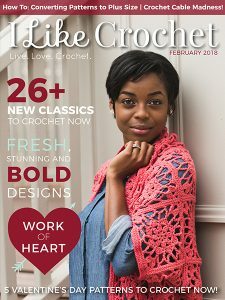 Gone are the days of basic granny squares in boring colors. 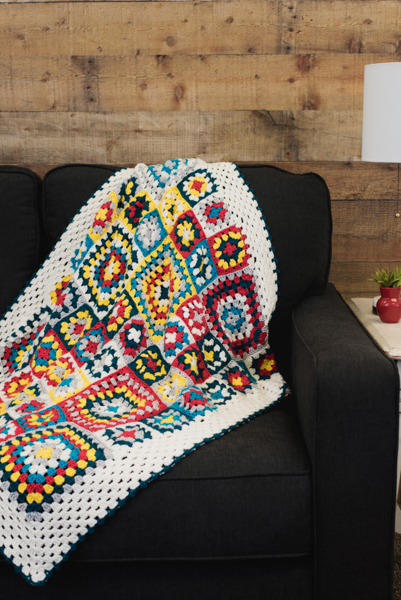 Spice up the tradition with granny squares that are crocheted in various sizes to give this blanket a patchwork feel. 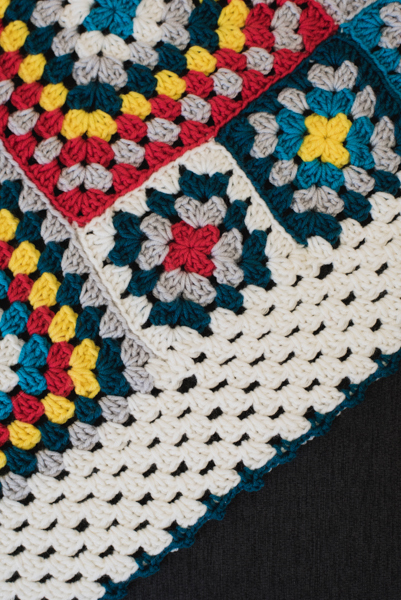 The layout of this blanket and the added border will keep you interested and excited throughout the crochet process. 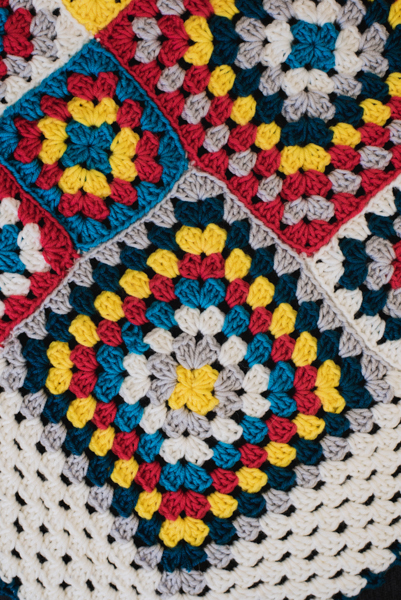 Each Round is worked in a different color. Rnd 1 (RS): Ch 5 (counts as dc, ch 2 here and throughout), 3 dc in ring, (ch 2, 3 dc in ring) twice, 2 dc in ring, join with sl st in 3rd ch of beg ch. Fasten off. 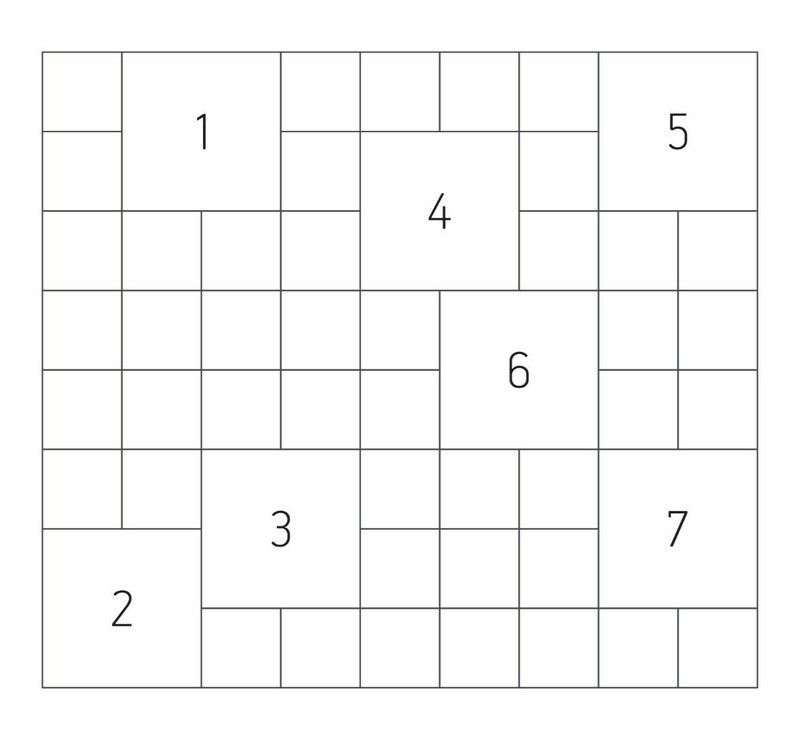 Rnd 2: Join 2nd color in any corner ch-2 sp, ch 5, 3 dc in same sp, *ch 1, (3 dc, ch 2, 3 dc) in next ch-2 sp; rep from * twice more, 2 dc in first ch-2 sp, join with sl st in 3rd ch of beg ch. Fasten off. Rnd 3: Join 3rd color in any corner ch-2 sp, ch 5, 3 dc in same sp, *ch 1, 3 dc in next ch-1 sp, ch 1, (3 dc, ch 2, 3 dc) in next ch-2 sp; rep from * twice more, ch 1, 3 dc in last ch-1 sp, ch 1, 2 dc in first ch-2 sp, join with sl st in 3rd ch of beg ch. Fasten off. Rnd 4: Join next color in any corner ch-2 sp, ch 5, 3 dc in same sp, *(ch 1, 3 dc) in each ch-1 sp across to next ch-2 sp, ch 1, (3 dc, ch 2, 3 dc) in next ch-2 sp; repeat from * twice more, (ch 1, 3 dc) in each ch-1 sp across to next corner, ch 1, 2 dc in first ch-2 sp, join with sl st in 3rd ch of beg ch. Fasten off. Rnds 5-8: Rep Rnd 4, changing colors in each Rnd. Rnds 1-4: Work same as Rnds 1-4 of Large Square. With right sides held together and working through outer loops only, sl st squares together with A as show in assembly diagram. Rnd 1 (RS): Join A in any corner ch-2 sp, ch 5, work 3 dc in same ch-2 sp, ch 1, (3 dc, ch 1) in each ch-1 sp across to next joined ch-2 sp, *ch 1, dc2tog over same ch-2 sp and next ch-2 sp, (3 dc, ch 1) in each ch-1 sp across to next ch-2 sp; rep from * across to next corner**, (3 dc, ch 2, 3 dc) in next corner ch-2 sp; rep from * around, working 2 dc in same sp as ch-5 at beg of rnd, join with sl st in 3rd ch of beg ch-5. Rnd 2: Sl st in first corner ch-2 sp, ch 5, 3 dc in same sp, (ch 1, 3 dc) in each ch-1 sp across to next corner ch-2 sp, ch 1, (3 dc, ch 2, 3 dc) in next ch-2 sp; rep from * around, working 2 dc in same sp as ch-5 at beg of rnd, join with sl st in 3rd ch of beg ch-5. Rnd 1 (RS): Join E in any corner ch-2 sp, ch 1 (does not count as st), (sc, ch 3, sc) in same ch-2 sp, (3 sl st through back loop only) in next 3 dc, (sc, ch 3, sc) in each ch-1 sp across to next joined ch-2 sp, (sc, ch 3, sc) in next corner ch-2 sp; rep from * around, join with sl st to first sc. Fasten off. Weave in any rem ends.